"I must admit that DVD discs are truly vulnerable and easy to be scratched. So now I prefer to rip them to hard drive, even better to rip some of my favorite DVD movies to my iPhone so that I can watch movies wherever I go. But ripping copy protected DVDs is really a big headache." Is It Possible to Rip Copy Protected Movie DVDs? In the very beginning, DVD movie producers introduced DVD copy protection and encryption technologies to avoid mal use of DVD contents. Till now, dozens of DVD copy protections have emerged, such as Content Scramble System (CSS), Region Code Enhanced (RCE), User Operation Prohibition (UOP), Sony ARccOS DVD protection, the Analog Protection System, etc. Its alleged purpose is to stop piracy, but at the same time it prevents people from ripping such protected DVDs for personal use. Luckily, with current technology, ripping DVD movies (even copy protected DVDs) becomes a simple button-hitting operation as long as you get a right DVD ripper. Yet when comes to DVD ripper freeware for copy protected DVDs, it's hard to say. Even the famous free DVD ripper software - HandBrake must co-work with a third-party program to rip CSS encrypted DVDs. Don't worry. It's still possible to easily free rip copy protected DVDs with WinX DVD Ripper freeware, like rip the popular 2017 Oscar winners Manchester by the Sea movie DVD, Moonlight movie DVD, etc. WinX Free DVD Ripper - Free rip copy protected DVDs to MP4, iPhone, Android, etc. WinX DVD Ripper Platinum - Rip any DVD (incl. latest copy-protected DVD) to any popular format/device easily. Hardware Acceleration tech is integrated for faster performance. WinX Free DVD Ripper is totally free DVD ripping software, which has been an expert in encrypted DVD backup for over 10 years, favored by countless users and editors. It is able to remove some DVD copy protections, such as CSS. This DVD ripper freeware also can rip copy protected DVDs to digital file formats, like MP4, WMV, FLV, MOV, MPEG, MP3, etc. Besides, it supports converting protected DVDs to portable devices. * Parry common DVD encryptions like CSS encryption, region code, Sony ARccOS, UOPs, APS, RCE. * Free rip copy protected DVDs to MPEG, WMV, FLV, MOV, MP4/H.264, iPhone Xs/Max, Apple TV, HTC, Samsung, PSP. * Free rip feature-length copy protected movie DVDs with faster speed than other free DVD rippers. 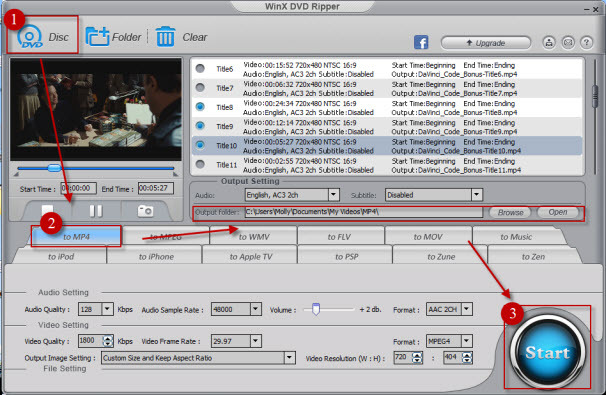 As we mentioned before, WinX Free DVD Ripper handles most copy protections very well and should meet your needs. But if you always come up against latests DVDs released by Disney, Paramount, Warner Bros., etc and protected with Disney X-project DRM, or DVD with 99 titles, workout DVDs or Japanese AV DVDs, you should turn to a Platinum Version of this free DVD ripper software, which costs you a little but performs much greater. Next table lists main differences between the Free DVD Ripper and the Platinum version. Check it out, if necessary. How to Rip Protected DVDs with Free WinX DVD Ripper? Firstly, please free download and install this free DVD ripping software on your computer before ripping copy protected DVDs. Tips: This is a totally free DVD ripper. No malware, no spyware, no adware. 100% clean and safe. Step 1: Launch this DVD ripper freeware and import a copy protected DVD by clicking "DVD Disc" button. 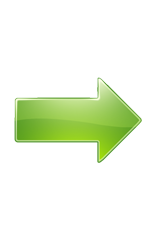 DVD ripper will read and analyze the DVD info to auto check the right DVD main title to help you save a lot of trouble. Step 2: Select your target video format or device. The most commonly used MP4 format is availabe. Note: You should also choose where to store the ripped DVD movie files by clicking "Browse" button. Step 3: Hit "Start" to begin ripping copy protected DVD with this free DVD ripping software. After the DVD ripping is finished, you can transfer the digital movie video to any of your iOS devices for watching on the go not using annoying iTunes, but our stunning iOS media file manager product - WinX MediaTrans. Plus, it makes iOS video/music/photo backup a super easy job. • Support almost all copy-protected DVDs like latest DVD movies/TV shows, 99-title DVDs, workout DVDs and special DVDs by removing protections incl. CSS, region code, RCE, Sony ArccOS, Disney DRM and more complex schemes. 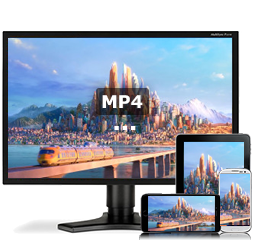 • Convert and rip any DVD to MP4 (H.264), AVI, WMV, MOV, FLV, MPEG2, iPhone, iPad, Android, Windows Mobile, Xbox, Sony PlayStation, smart TVs etc, with ease. • Take full advantage of Hardware Acceleration with integration of Intel QSV, NVIDIA NVENC to greatly speed up DVD ripping speed and maintain nearly lossless quality. Rip Copy Protected DVD to Hard Drive as MP4, AVI, FLV, MOV, etc. 1. Rip any copy protected DVD movies on PC effortlessly. 3. Copy DVD main/full title with all videos, audios, subs in.